Gina Steinberg, a graduate of Perth’s Carmel School has commenced a double degree in Commerce and Science (Psychology) at Curtin University after having won a prestigious John Curtin Undergraduate Scholarship. Gina is one of only ten students to be awarded the scholarship for 2018, which covers all course fees plus awards her $6,000 to use for an overseas exchange experience. After completing her WACE in 2016, Gina spent a ten months in Israel on the Habo Shnat gap year experience. This time abroad provided a wide range of leadership, volunteering and educational experiences, including living and working on a kibbutz and volunteering in a day care centre for refugee children. Gina’s experience abroad was formative, and she particularly enjoyed being immersed with the local culture. 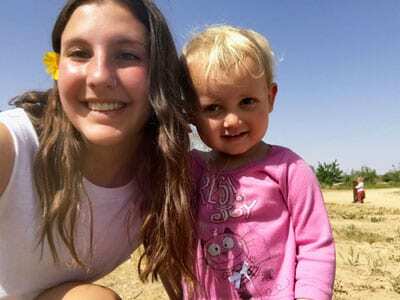 “My Hebrew language developed significantly, and I got to experience a lot of what Israel has to offer as I travelled throughout the country, meeting people and connecting with the land through hikes and day trips,” she said. Gina also developed her independence, and enjoyed living in share housing in Tel Aviv with other young people from around the world. Preparing her scholarship application from the other side of the world, to send to Curtin University in Perth, was an exercise in logistics which involved assistance from her family and teachers at the School. The process of applying, which included a written essay on a topic meaningful to her, allowed Gina to reflect not only on her academic achievements over her school life, but also what motivates her outside of the classroom and where she hopes to make an impact in the future. Gina has chosen to study Psychology and Commerce at university because she likes the idea of working with people as a Clinical Psychologist, and hopes the Business component of her studies will give her both a competitive edge as well as a broader field of study to satisfy her many interests. The John Curtin Undergraduate Scholarship includes a mentoring and alumni program that Gina can access to meet other students and graduates who are working in her field of interest. She also completes 24 hours of community service each semester, enabling her to build on her treasured experiences of giving back to the community, which she developed at school and nurtured while in Israel.